Affiliations: Batroc's Brigade (Batroc, Machete, Zaran), Oddball, and Taskmaster. Powers/Abilities: Albino possesses no powers. She has not only studied various human mutations, but through technology has learned how to mimic them. 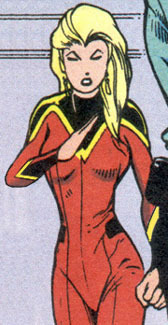 However she has only been shown to render herself invisible using a chameleon field. History: (Hawkeye: Earth's Mightiest Marksman#1) - Using her real identity, but disguise and a fake employment as a computer programmer in Virtual War Themes, Albino visited Hawkeye (Clint Barton) at Avengers mansion. She managed to convince him that she needed help protecting a computer virus capable of creating chaos throughout the world from falling into the wrong hands. Hawkeye escorted her to her place of business and was attacked by Batroc's Brigade. Hawkeye managed to defeat Batroc's Brigade and found a mask with Augusta Seger's face on it. Along with a group of Taskmaster's trainees, the Albino took control of the south Manhattan Police Department by knocking out the entire department with gas. Albino freed Batroc and his Brigade and paid them extra to not attempt revenge. Now in full control of the police department, Albino began to set another trap for Hawkeye. Soon after Hawkeye and Justice (Vance Astrovik), Taskmaster and Albino watched on monitors as her trap was put into motion. Not only did the two heroes find themselves in the middle of a prison break, but the master juggler known as Oddball was there as well. Hawkeye and Justice (Vance Astrovik) managed to defeat and capture the entire group. Soon after, Albino contacted Hawkeye and arranged for a meeting. Even though he realized it was a trap and brought Justice and Firestar with him, Albino was able to capture the group. 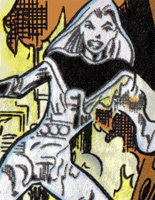 Using Pym Particals, Albino shrank the three down and placed them in a specially constructed maze in order to conduct her experiment on Taskmaster. Taskmaster watched the three of them battle his robot Avengers from a chamber that altered his body to allow it to work on powers the same way his photographic reflexes work on abilities. The three managed to escape before the process was complete, but Taskmaster was more than willing to test his new found powers despite the powers only being temporary. Taskmaster flew outside to be able to maneuver better for his battle with Justice and Firestar, leaving Albino to deal with Hawkeye. Albino was able to render herself invisible using a chameleon field and attacked Hawkeye. Despite being completely invisible to the naked eye, Hawkeye was able to capture Albino using a net arrow. With Hawkeye no longer occupied, he was able to help Firestar and Justice defeat Taskmaster. Comments: Created by Tom DeFalco, Jeff Johnson, and Jim Novak.